Senior dogs stand a smaller chance of being adopted than younger ones, so when 13-year-old Muffin popped up on Kathy Martin’s computer monitor as the Ocala, Florida, woman browsed on Petfinder, Kathy was worried about the dog’s future. It would be a shame for the Chihuahua/Terrier mix to spend her golden years in a shelter. “I don’t know how much time she had left, but it seemed unlikely anyone would adopt her,” Kathy says. Muffin is in a good place to spend her golden years. She drove about two hours to meet Muffin, who was listed on Petfinder by Seminole County Animal Services in Sanford, Florida. She learned that the dog had been turned in by her former family after only one year and that she didn’t get along with kids, but was fine with other animals, a lucky break since Kathy has six other dogs: Zoey, Sunny, Ruby, Arnie, Corey and Sterling. The dogs welcomed one more into their pack of mixed breeds, former strays and puppy-mill rescues. Like Muffin, Sterling and Corey were owner surrenders. Corey, a 14-year-old, is totally blind and has a crippled back leg. Muffin sleeps in bed with Kathy, along with three or four of the other dogs, all wanting to be close to this person who gave them a second-sometimes a third-chance at a good life. “Muffin doesn’t start any trouble,” Kathy says, “but I noticed she stared down my Min Pin, Ruby, when she wanted Ruby to get away from a dog food bowl. Ruby usually doesn’t back down, but in this case she did.” Muffin’s expression apparently said plenty to Ruby. 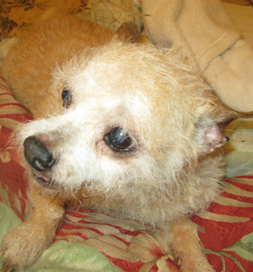 Kathy speculates that the little old dog belonged to an elderly person who passed away, and for some reason, the person’s family decided not to keep her. Thanks to Kathy, though, she was only at the shelter for about three days and is now happily part of a new family.